If it's Wednesday, it must be The Wednesday Quilt Show! This week we're going to look at a couple of the most talented long-arm quilters I've ever seen! If you want your quilt shown here with a link to your blog or website, please shoot me an email at milodesigns@embarqmail.com or check the submission guidelines found to your right. No blog or website? No problem - I'll share your quilt as well! Sheryl is an incredible long-arm quilter. Her level of detail is amazing! but you can see some of the quilting in the detail below. I was fooled into thinking these were curved-pieced blocks at first. She took the ordinary and made it into something extraordinary! Beautiful Modern quilt! Each fabric has a different pattern. I love the circles. So much of quilting is square - circles make a nice contrast. When I started quilting, I concentrated on the piecing/applique and let the quilting go. I think that's my biggest regret as a quilter. 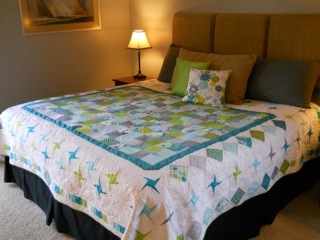 Now 18+ years into it, I'm a good top-maker but not a quilter! 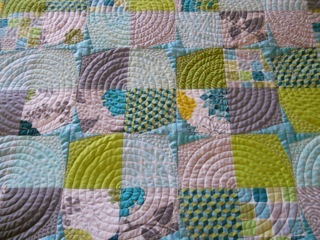 Of course, when I started out you still heard: "If it's not hand quilted, it's not a quilt." a lot. Now, does anyone hand quilt anymore? (I know they do!) Back then stippling was the preferred (and only) type of machine quilting you could get. Now thanks to women like Sheryl and Angela pushing the boundaries of what machine quilting is, the quilting is a part of the overall quilt design - not so much just to hold the layers together. I still hand quilt! wish I had more time for it, though. The machine quilting you show here is wonderful! I hand quilted my first two quilts and that was enough for me! It's just not my passion right now. But, who knows? I might get back to it some day! I admire all who still do it, though!